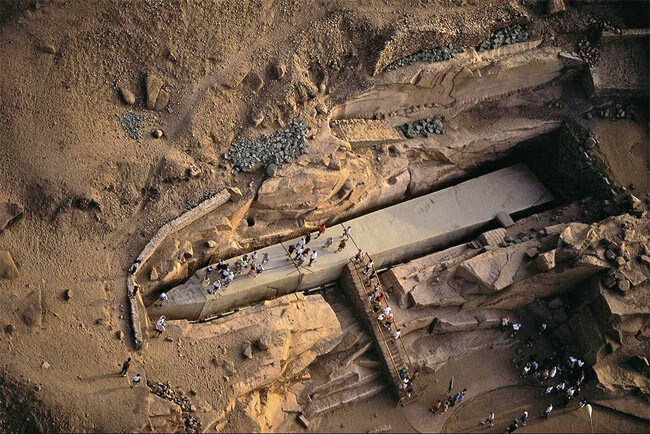 The largest obelisk ever has been discovered in the northern region of ancient Egypt. The stone quarries in Aswan house an unfinished obelisk, which has baffled scientists and disturbed historians to the point of denial. Its discovery has split the academic community- with archaeologists arguing that the female pharaoh known as Hatshepsut must have sanctioned its construction. Distressed modern engineers are in fierce opposition- claiming that the Dynastic Egyptians simply could not have the technology needed for such a structure. “It is nearly one third larger than any ancient Egyptian obelisk ever erected. If finished it would have measured around 42 m (approximately 137 feet) and would have weighed nearly 1,200 tons. Aside from the problem of shaping it, how were they presuming to lift it out of the quarry?” Seethed Brien Foerester, one of the world's most recognised experts on the subject. The conventional academic community put forward the hypothesis that the obelisk was shaped with diorite stones. Brien Foerester was quick to denounce these baseless and misguided allegations. He noted that diorite has hardness, out of 10 on the Mohs scale (diamond being 10) of 6 to 7, which is basically the same hardness as the granite. Consequently, this technique would have been, at the least extremely unproductive and realistically verging on the impossible.